Low cost 200w power inverter on car for charging iPad, iPhone, tablet computer etc. Invert car battery 12v DC to AC 110v/220v modified sine wave, suitable for most of home small capacity devices. 200 watt car power inverter with USB port for charging iPad, iPhone etc. Tips: What is the general battery size of a family car? Generally, a small car with the cylinder volume less than 1.3 liter, the battery size is 40-45 Ah, a middle-size car with 1.6-2.0 liter cylinder volume is equipped with a battery of 50-60 Ah, a large car with 2.2 liter cylinder is equipped with a battery of 60-80 Ah. Off-road vehicles, multi-function vehicles' battery capacities are generally higher than the same volume engine cars. The volts of the battery typically use 12v, diesel engine vehicles (including trucks) mostly use 24v battery. 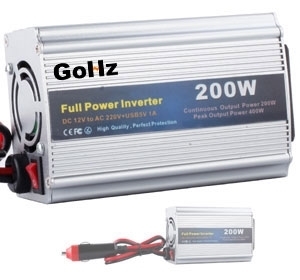 Buy a 200w car power inverter to charge to iPad, iPhone, tablet computer now.